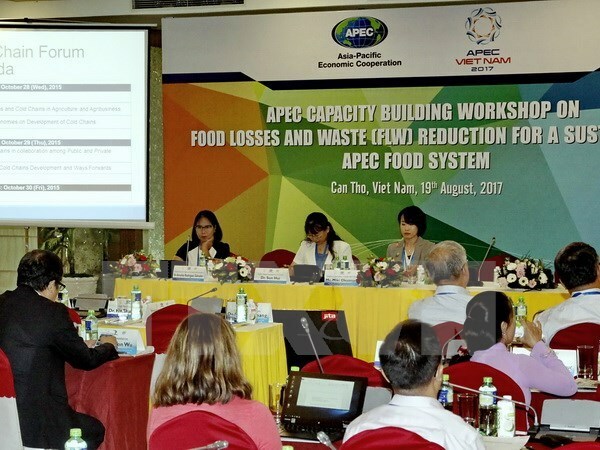 Can Tho (VNA) – Experts gathered at a workshop in the Mekong Delta city of Can Tho on August 19 to seek ways to reduce food losses and waste, and ensure a sustainable APEC food system. The event formed part of activities during the APEC 2017 Food Security Week and the High-Level Policy Dialogue on Enhancing Food Security and Sustainable Agriculture in Response to Climate Change in the city. Participants focused on how to evaluate food losses and waste reduction, sharing experience and solutions of the private sector in reducing food waste, reviewing APEC’s projects on reducing food losses and waste, and how to enhancing the awareness toward sustainable development. According to the UN Food and Agriculture Organisation (FAO), nearly 800 million people are undernourished globally, of them 500 million are in the Asia – Pacific region. Around 1.3 billion tonnes of food or one third of the global food output, worth nearly 750 billion USD, are lost and wasted each year. The amount, if saved, is enough to feed two billion people. Food is mainly lost during post-production and harvest, transport and preservation in developing nations due to poor infrastructure while food losses take place in marketing and consumption in developed nations. Food loss and waste reduction was noted in the APEC declarations on food security in 2010, 2012, 2014 and 2016 to ensure sustainable agriculture development and food security for APEC economies. One of the objectives of the APEC food security roadmap to 2020 is to cut down food losses and waste by 10 percent from 2011 – 2012. Gong Xifeng, head of the APEC Agricultural Technical Cooperation Working Group, called for a combination of public and private resources in APEC economies to reduce food losses and waste. Meanwhile, Tran Kim Long, Director of the International Cooperation Department under the Vietnamese Ministry of Agriculture and Rural Development, underlined a need for incentives to encourage investment and technology application in agricultural production, and the active participation of the private sector and consumers.